Typically could just change the password to lock out the user and keep the inbox for a period of time (e.g., 6-12 months) in case ever need to research an email communication. Then set up that account to forward to another inbox. Here’s how to setup automatic email forwarding. It requires a verification step so be sure to follow the instructions and send a test to the old address to make sure it forwards to the new inbox. Delete the old user account. Then add that email address as an alias on another user’s account. Here’s how to setup an email alias. Be sure to send a test to the old address to make sure it shows up in the new inbox. 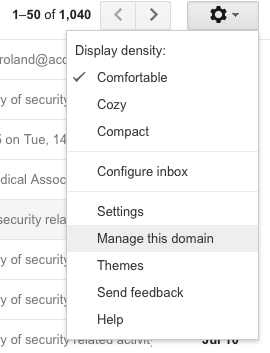 When you are logged into Gmail, at the upper right corner you’ll see a gear icon. Click on it and then click “Manage this Domain”.